We’d love your help. 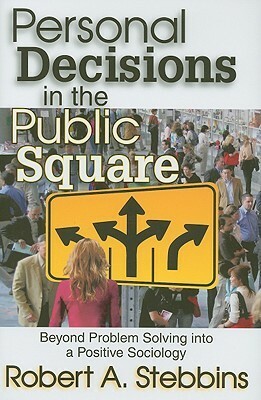 Let us know what’s wrong with this preview of Personal Decisions In The Public Square by Robert A. Stebbins. This work looks into how, why, and when people pursue things in life that they desire, those that make their existence attractive and worth living. Robert A. Stebbins calls this "Positive Sociology," the study of what people do to organize their lives such that they become substantially rewarding, satisfying, and fulfilling. Western society has many challenges: crime, drug This work looks into how, why, and when people pursue things in life that they desire, those that make their existence attractive and worth living. Robert A. Stebbins calls this "Positive Sociology," the study of what people do to organize their lives such that they become substantially rewarding, satisfying, and fulfilling. Western society has many challenges: crime, drug addiction, urban pollution, daily stress, domestic violence, and overpopulation. Significant levels of success in avoiding these problems brings a noticeable measure of tranquility, but it does not necessarily generate a positive life. Personal Decisions in the Public Square draws upon, in large part, the sociology of leisure, a "happy science." Among the basic concepts in the sociology of leisure are activity and human agency. The centrality of positive activity is one of its hallmarks and separates it from other social science specialties. Stebbins's positive sociology centers on conceptual roots found in the "serious leisure" perspective. This theoretical framework synthesizes three main forms of leisure (serious, casual, and project-based) while showing their distinctive features, similarities, and interrelationships. Positive sociology also considers two other domains of life: work and non-work obligations. To ask other readers questions about Personal Decisions In The Public Square, please sign up.